Table 6-2 compares Zi, Zo, and Av, for difference Between Common Base Common Emitter and Common Collector circuits. As already discussed, the CE circuit has high voltage gain, medium input impedance, high output impedance, and a 180° phase shift from input to output. The CC circuit has high input impedance, low output impedance, a voltage gain of 1, and no phase shift. The CB circuit offers low input impedance, high output impedance, high voltage gain, and no phase shift. 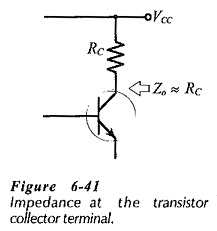 Device manufacturers normally only list the CE h-parameters on a transistor data sheet. Although these can be converted to CC and CB parameters, it is convenient to use CE parameters for all three types of circuits. 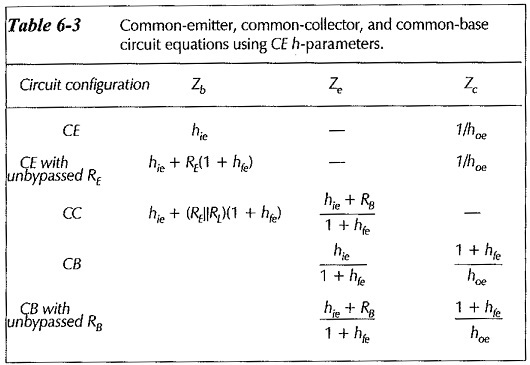 Table 6-3 gives the circuit impedance equations in terms of CE h-parameters. In the case of input and output impedances, it is helpful to think in terms of the terminal being looked into. 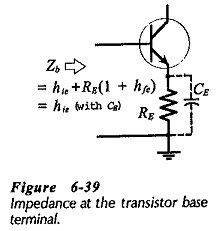 where RB is the impedance ‘looking back’ from the transistor base. In the case of a circuit with an unbypassed emitter resistor, the ac voltage at the emitter follows the ac input at the transistor base. So, a CC circuit (an emitter follower) has a voltage gain of 1. 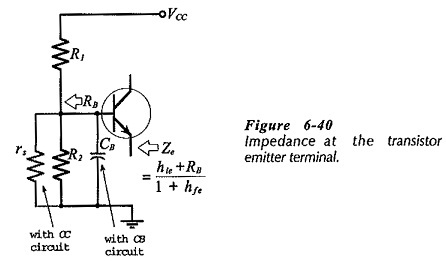 With both CE and CB circuits, the ac input (vi) is developed across the base-emitter junction, and the ac output (vo) is produced at the transistor collector terminal, (see Fig 6-42). Thus, the magnitude of the voltage gain is the same for CB and CE circuits with similar component values and transistor parameters. 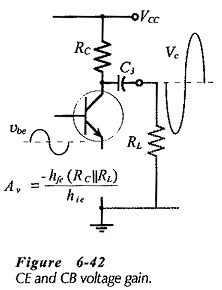 The CE voltage gain equation can be used for the CB circuit, with the omission of the minus sign that indicates CE phase inversion. Although the voltages gains are equal for similar CB and CE circuits, the low input impedance of the CB circuit can substantially attenuate the signal voltage, and result in a low amplitude output.